Valueback is the OnGame network's version of rakeback. Valueback is just like rakeback - you get a portion of the rake you pay back to your account. Instead of receiving a set %, the % valueback you receive changes based on how many points you collect. The more points you collect, the more valueback you get paid to your account. The term "valueback" can be confusing, so just think of it as a form of rakeback. It's what OnGame skins use to call their rakeback deal. 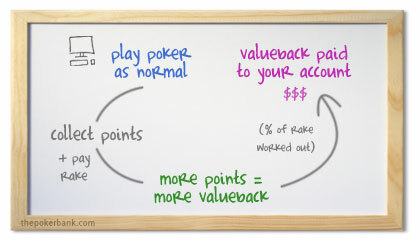 The difference between rakeback and valueback is that your valueback % moves up or down depending on how many player points you collect, whereas with rakeback you receive a fixed percentage at all times. How much valueback can I get? Between 8% and 20% for the majority of players (depending on how much you play). Between 30% and 40% if you are a higher stakes player and play very regularly. The majority of players will receive more rake back to their account through rakeback deals as opposed to valueback deals, especially if you are a lower stakes player. However, if you a regular player at the higher stakes games, it is possible to earn more of your rake back through valueback as the percentages go as high as 40%. The only problem with this is that it will take time to reach these levels of valueback, whereas you receive your set amount of rakeback (with rakeback deals) instantly. How do I sign up for valueback? Signing up for valueback is just as straightforward as it is to sign up for rakeback. Choose a room in the valueback rooms section on this site. Sign up to the poker room. The difference between valueback and rakeback is that valueback is available to all poker players. So for example, with rakeback some players do not receive it because they did not sign up through special rakeback websites. However, everyone gets valueback regardless of where you sign up, so there is no need to clear your cookies before signing up for valueback at a poker room. Where can I find out more about valueback? Valueback is just like rakeback, but that still doesn't mean it is easy to understand (I had a lot of trouble getting my head around it at the start). So for all of you that still have valueback questions that you want answered, I have compiled a short but sweet valueback FAQ to help you out. Failing that, send me an email at greg[at]thepokerbank[dot]com and I'll try my best to answer your questions.